I have helped hundreds, if not thousands, of candidates, friends and family prepare for employment interviews. I am frequently asked, “What questions should I be prepared to answer in my interview?” There are several questions you should be prepared to answer. What are your strengths and weaknesses? What has been your greatest accomplishment? Why did you leave your previous employer? What do you know about this company? Why should I hire you? These questions, and thousands of others, are asked with varying frequency depending on the interviewer and his or her style, training or mood. What is the one question that is asked in every interview? Here’s a hint, it is usually asked at the end of the interview, after the hiring manager has asked his questions. The question is “do you have any questions?” Sounds fairly benign, doesn’t it? Sometimes this question is asked just to be polite. After all, isn’t it fair to allow you to ask me a question after I have hammered you with questions for the last 45 minutes? What is the worst possible answer to this question? “No, I don’t have any questions.” Or, if you are real sharp, you may compliment the hiring manager and say, “No I don’t have any questions, I think you’ve covered everything.” What is the hiring manager thinking when you tell him that you don’t have any questions? of you who do read the rest of this article you are assured of gaining an advantage over those who do not. questions wins…every time. Now imagine that at the end of each of these ten interviews the hiring manager asks, “Do you have any questions?” An accurate estimate of the ten answers to that question will be that four will have no further questions, five will think on their feet and come up with a few good questions, and after reading this article, one will ask a handful of killer interview questions that will blow the hiring manager away and he/she will get the job offer. I have been running a successful recruiting and placement agency for most of my adult life. My job is to put three highly qualified candidates in front of a hiring manager for every position we recruit for. Often there is a close race and a tough decision for the hiring manager to make. I have lost count of how many times the hiring manager has called to say something like this, “Those were all good candidates Jim. I have a tough decision, but Jane was really sharp, what impressed me were the questions she asked, I would like to offer her the job.” When interviewing someone to come to work for me I assess the person’s intelligence by the questions they ask. Hopefully I’ve made my point. Make sure you ask good questions. So, what are the best questions to ask? Let’s start with the worst questions to ask. Besides having no questions, the worst questions are self-serving questions. How much time off will I get? What does the position pay? How long will I have to stay in this position before I can advance? Can I work flexible hours? Do I have to travel for this job? Although you may be thinking that you need to know the answers to these questions before you are interested, when you lead off with questions that have to do with you and not them you are on thin ice. This may seem apparent but you may be surprised how many people blow the opportunity this way. The best thing to do is to come prepared to the interview with a written list of questions you can refer to. When the interviewer asks, “Do you have any questions,” you should say, “Yes, I’ve prepared some”. Then you can pull the list of questions from your portfolio, check off the ones that were already covered and ask a set of killer questions. Let’s again imagine yourself in that interview for the job you really want, competing against ten people. If you are the only one who pulls a written list of questions out when you are asked, what is the invisible message you send? I come prepared for my meetings. 1. How would you describe the culture of the company? 2. What is the work environment like here? 3. What do you think people like the most about working here? 4. What are the characteristics or traits of your top people? 5. What are your core values, and what traits do you look for in your employees? 6. What makes this company superior to your competitors? 7. If I were to ask your customers and competitors about this company what would they say? 8. What is the average tenure of the people working here? person I will be working for? 10. What is the strategic direction of the company? 11. What value can this position lend to the strategic mission? 12. If I do my job particularly well what impact can I have on the organization? 13. How does this position help make your job easier? 15. How will my performance be measured? 16. What are your objectives for this position in the first year? 17. What is the one thing I can accomplish that will tell you I have done a good job in my first 12 months? 18. What is the greatest challenge I would face in the position? 19. How do my skills seem to line up with your needs? 20. How did the last person who had this job perform? 21. What one thing would you have added to the person who had the job to make them better at it? 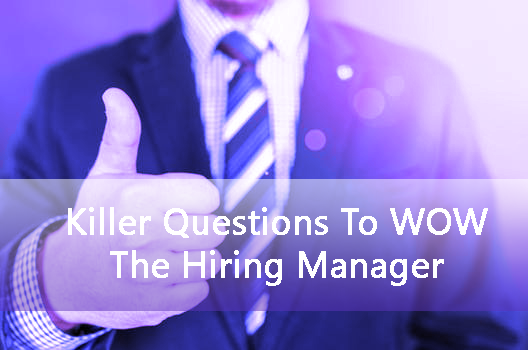 The idea behind asking these questions is to inspire the hiring manager to think. These are questions that serve two purposes. First, they will WOW the hiring manager because you will cause them think. By asking strategic and thought provoking questions you sound like a consultant. They will differentiate you and impress them…guaranteed! Second, they create two-way dialogue about the worker/manager and worker/company relationship. The answers you receive will give you insight that will allow you to decide if this job, hiring manager and company are right for you.